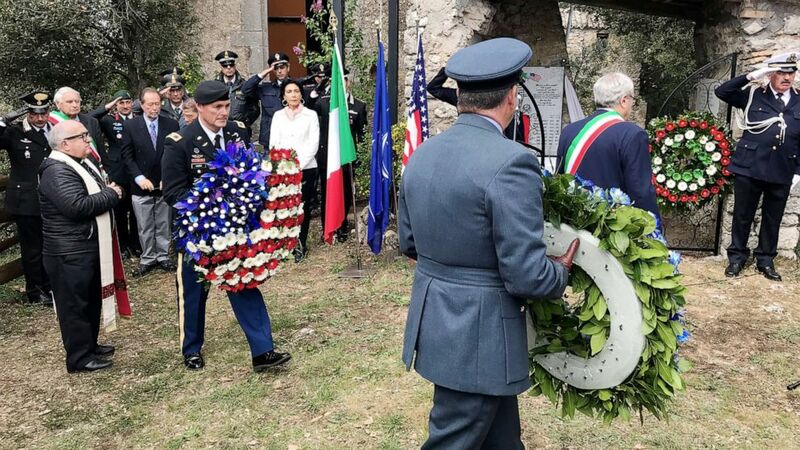 Rome -- Seventy-five years after eight U.S. servicemen were summarily shot at a hermitage on the top of a mount overlooking the Italian village of Montebuono during World War II, local Italian and foreign residents came together to honor them. The village organized more than 20 four-wheel drive vehicles to take roughly 80 participants, including local dignitaries and NATO representatives from the U.S., U.K. and Canada, to the commemorative ceremony on Saturday. The event included the town band playing the American and Italian national anthems, the unveiling of a new plaque and the laying of wreaths. The eight servicemen had lived on the run for more than two months after escaping from an unmarked German prisoner-of-war train, which was travelling up through Italy to Germany. It had been repeatedly struck by U.S. B-26s on January 28, 1944, as it was crossing the Allerona Bridge, north of Orvieto in central Italy. Little was known about the tragedy until documents were uncovered and a monument was erected near the rebuilt bridge in 2012. Over 1,000 Allied American, Britons, South African and other POWs were on the train locked in about 50 cars being escorted by the retreating Germans. Ten cars were believed to have been destroyed. It is still not known exactly how many of the POWs died but estimates range from 200 to 600. Local people who came to help with the wounded described seeing a scene of chaos and horror and a "mountain of corpses," according to The Guardian. Records of great heroism have emerged as POWs helped the wounded or freed others still locked in the rail cars. Approximately 200 people were wounded and were taken to nearby hospitals. A large number escaped across the hills, some heading south to try to reach the Allied lines, while others hid out waiting for the friendly troops to reach them on their northward thrust. Some of the escaped POWs were recaptured and put back on trains to Germany and others caught escaping were shot. Historian Jane Kinrade Dethick, who has meticulously researched POWs in Italy, told ABC News that approximately 500 who weren't wounded or killed escaped. "Some were captured that day, some were captured after a week, some were captured after three months and some were never captured," she said. Not much is known about the eight remembered on Saturday -- about how they were hidden at the hermitage and what their plan was to survive. "All we know is that they were woken up one morning and killed, shot dead by the German military police who had the task of rounding up deserters from the Italian army, partisans and escaped prisoners of war," Kinrade Dethick said. "Why they didn't arrest them and take them to their command, which is what normally happened, we do not know because there was nobody else there to tell us. "They didn't leave us any written records," she added. Kinrade Dethick said three weeks earlier the group met an American airman whose plane had been shot down. He, too, was on the run, she said. "They gave him their names and addresses and military numbers and when he joined up with Allied troops he told them about the eight," she added. Dethick said there are two possibilities: that someone told the Germans about the Americans hiding on the hill, or that the servicemen fell into a net, since German police would scour the area to locate enemies shooting at them. ''They were there to capture the POW who may have joined the partisans or the partisans who they called 'bandits,'" she said. "Basically, they were after anyone who posed a threat to their military." The organization run by the Vatican may known the servicemen, and someone in town, perhaps the priest, gave them money to buy food, Dethick believes. The town continues to remember the soldiers every year and makes an annual pilgrimage to the hermitage. People in the town remembered their parents giving them bread and food and recounted hearing repeated shots from up on the hill. Nello Lucchetti, an 88-year old local, remembers when he was just 13, climbing up to the hermitage after they were shot and seeing the eight bodies lying in a line on the ground. Harry Schindler, a 97-year-old UK veteran who landed at Anzio in 1944 and still lives in Italy, came to the ceremony to pay his respects. "My war is not over,'' he told ABC News as his book, which recounts life in Italy during World War II, is entitled. "I am still getting letters from grandchildren of people who fought in the war wanting to know more," he said. Speaking to the townsfolk after the ceremony, Schindler recounted the immense kindness of the Italians who helped the Allied soldiers. "The war would have been longer, more horrible, without that partisan help that liberated Italy," he said. "If we really want to remember these eight soldiers, we must explain what war was, not just how horrible war was - the deaths - but about the loss of freedom, how one couldn't talk freely then and how we must work for peace and freedom. "We have to make sure that our children will not have to do what we had to do, when the 1st World War ended," he warned. "The whole world said, 'Never again,' but in only 20 years, they were involved in another war." He added that everyone should be indebted to the eight servicemen and the "thousands of young men who died when they came to Italy to remove a regime." "We won, and so democracy and freedom returned to Italy," he added. "And when we came to Italy, the Italians, good people, helped us."